Happy lesbian couples know their partner (I know, imagine that). Most people literally spend more time consciously researching, exploring, identifying, and learning about the car that they intend to buy than they do in their mate-selection process. How crazy is that? If it’s true what the US Department of Transportation says, that the average life of a car is 12 years, then how long do you think the average life of a happy lesbian relationship is going to be if we put less time into selecting a mate than a car? Once you are in a relationship, it’s easy to let your curiosity wane. One of the ways to stay in touch with your partner on a continuous basis is to stay current with the changes in her life. When she develops new interests, talk about those with her. When she is struggling with friends, family or coworkers, take time to understand how it is affecting the person she is and the person she is growing into. 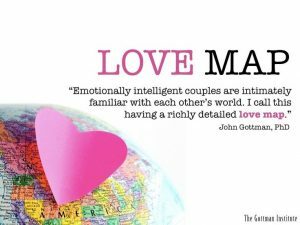 Dr. Gottman who has spent his career researching relationships, calls the process of getting to know your partner, knowing her love maps. He explains it this way, “When you choose to spend your life with someone, you hand them a map to your inner world. Your inner world is, of course, quite complex including the memories of your past, the details of your present, your hopes for the future. It includes your deepest fears and your grandest dreams. But the map you hand your partner is a pencil sketch.” Your task is to keep deepening your understanding of this love map and make it a habit for life. It is not good to assume that you know your partner. We humans are constantly changing. If you don’t stay curious, you may miss some very slow growing changes that eventually create new beliefs, dreams, behaviors and attitudes in your partner. A fun way to keep the curiosity alive in your relationship is to pick up my book or app, “Ask Me! 1,000 Questions to Grow Your Relationship.” Keep a copy in your bed night stand so it is handy to generate random conversations about numerous topics you otherwise may never discuss. Or get the app and have it everywhere you go. The Gottman Institute (which is a relationship institute where I completed all three core clinical trainings – Level 1, 2 and 3 ) has a simple little quiz about how well you know your partner. They also promote a Love Maps app on iTunes, though my bias is that my 1,000 question app is much more helpful than their 86 question app and my book of 1,000 questions is more helpful than their Love Map & Open-Ended Card Decks (which also costs more and has significantly less questions). To take their simple little quiz to see how you fare with these 14 questions.